Ready Set Read Reviews is dedicated to producing and sharing reviews, previews, discussions, possible author interviews, and more ALL to do with the books out there for kids and teens. "Never go into the forest, for there are many dangers there, and they will ensnare your soul." Serafina has never had a reason to disobey her pa and venture beyond the grounds of Biltmore Estate. There's plenty to explore in Mr. and Mrs. Vanderbilt's vast and oppulent home, but she must take care to never be seen. None of the rich folk upstairs know that Serafina exists; she and her pa, the estate's maintenance man, have lived in the basement for as long as Serafina can remember. She has learned to prowl through the darkened corridors at night, to sneak and hide, using the mansion's hidden doors and secret passageways. 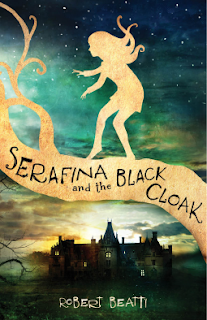 But when children at the estate start disappearing, only Serafina knows the clues to follow. A terrifying man in a black cloak stalks Biltmore's corridors at night. Following her own harrowing escape, Serafina risks everything by joining forces with Braeden Vanderbilt, the young nephew of Biltmore's owners. Braeden and Serafina must uncover the Man in the Black Cloak's true identity before all of the children vanish one by one. Serafina's hunt leads her into the very forest that she has been taught to fear, where she discovers a forgotten legacy of magic. In order to save the children of Biltmore, Serafina must not only face her darkest enemy, but delve into the strange mystery of her own identity. From the delightful cover to the story itself, this was a five heart read. Thanks to the publisher, author, and NetGalley for this review opportunity. What a great book! I quite enjoy a good YA title now and then, and this one did not disappoint with its fast paced mystery and action. Well developed characters with an exciting story to tell made for one hard to put down page turner. This is a book for readers of all ages, but does have a slightly dark edge to it which may be a little too intense for really young readers. I'd say 4th grade and up is probably an ideal age bracket. And it's perfect reading material for the remaining Summer holidays. WELCOME TO READY SET READ REVIEWS! Ready Set Read Reviews was created with kids, parents, grandparents, and teachers in mind. If you're looking to find reviews, previews, book tours, guest author blogs, book giveaways and more all to do with books geared towards children and young adults then you've come to the right place. There are so many incredible books out there for kids and teens. Unfortunately there are also a lot that aren't quite so fantastic. Here at Ready Set Read Reviews I look forward to sharing my thoughts and opinions on the books my girls and I read, introducing you to new authors and books you might not already have been aware of, and also helping save you the time and energy of having to weed out those books that just won't live up to your expectations. As a mother I find that I simply can't encourage my girls enough to read and enjoy the whole experience. And it's such a great feeling to see that love transfer to them and blossom into something wonderful. In short, it is my hope that through this blog I can share a little of that excitement with you and your children.